Sales rejection is a killer. But what dawned on my last week is that lots of sales people suffer from it and that many more of them are carriers. Sales Rejection | Are You Infected or a Carrier? 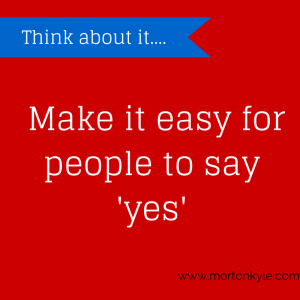 Do you have a genuine belief that a buyer will say no to your offer. Sometimes praying that the buyer will say no quickly so you can update your sales pipeline and move on to the next sales prospect who you also expect to say no. You don’t close at all because you’d rather have some sales pipeline of questionable value than an empty pipeline? How many of these symptoms have you got? I ask because sometimes we call catch sales rejection, might just be for a day, a week, a month, may just be when we hang out with certain people…but the first step to recovery is recognising we have it, and then set about curing it. Because there is a cure. Sales Rejection | The Story of Stephen. I see Stephen 4 times per yr as part of a sales audit I do for a national client. Steve is a top performer. He’s the guy I ask everyone to chat with if they’re struggling with sales. Steve tells it like it is. He challenges when he needs to, is great at listening, asks fantastic questions, and always closes. Everytime. He creates the conditions with the buyer where he doesn’t close until he knows he’ll get an answer he likes! BUT the reason Steve consistently smashes his sales targets, his cross sell lead gen, his up sell, and the reason why his average sales order value and customer lifetime order value is higher than anyone else is because Steve knows how to handle objections. At this, Steve is a GOD! So, having spend the week with Steve and his colleagues I move on to do some preliminary work on a sales turnaround project ready for next month. Here’s the guidelines Steve uses for handling objections, minimising sales rejection and turning that sales rejection into an order and an invoice. Steve only asks for the order when he knows he’s going to get a yes. So, Steve reduces the times he can get hit with the Sales Rejection virus. Until that point when Steve asks for the order and expects to get a yes, he uses that time by being a very valuable person to the buyer. During which, Steve is simply asking questions. Steve gets the buyer to clarify their own thinking, instead of bombarding his prospects with his noise. He challenges some of the buyers beliefs. Steve provides valuable insights, experience and acts as a first class peer to peer sounding board. Steve is also working with the buyer to help the buyer understand the cost of not buying. That’s a cost not just within his own business, but within the buyers, competitive market. After a while, the buyer sees Steve as a very valuable person to talk to. In fact, the buyer often calls Steve to have a chat about some aspect of the industry, competitors and, well, just stuff. The buyer is interested in Steve’s thoughts and views. It’s almost like the buyer has forgotten Steve is there to take his money off him! Steve never takes the first ‘no’ as an actual ‘no’. 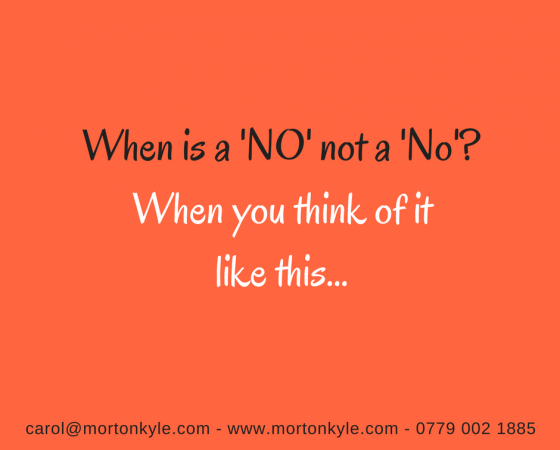 That would never occur to him to take the first ‘no’ as a final sales rejection. Do you know how much difference that makes to Steve’s sales performance? Huge amounts, so let’s take a closer look. Ok, so how does Steve flip this? First of all, let’s understand that Steve, wasn’t expecting this response, because, as above Steve doesn’t ask until he’s sure he’ll get a yes. So the first thing Steve needs to do is look at where the mismatch is, because obviously he and the buyer aren’t on the same page any more. Ok, so the time’s not right at the moment. What needs to change, for everything to slip into place so you can go ahead? Now, think about what this question encourages the buyer to do, and how Steve can benefit from this. Right, thanks for that. I understand where you’re coming from now. You know we talked about you losing £X K every month you didn’t have this solution in place? How viable is it really, as we sit here today, knowingly writing off a loss of 6 months worth of £XK whilst you get these other elements sorted? Instead, together, let’s find a better work around than this? What Steve’s just done, because he’s already calculated the Sales ROI for his buyer before the sales close, is be able to quantify the money lost due to waiting..the cost of doing nothing! But the buyer won’t hear that. Instead he’ll see Steve trying to help him save money. What Steve has also done, is make himself part of the fix with the buyer. Now they are a team. It’s a peer to peer conversation – not a battle of wills in a tense sales arena with the buyer running scared as happens here: Anyone Seen My Buyer? And it doesn’t stop because the buyer has given Steve an insight into what the blocks are, now Steve needs to challenge the buyers thinking and reframe those blocks as something else, maybe milestones, gateposts but certainly not full stops in the sales process. Steve now goes into a counselor mode with the buyer, where his job is not to provide solutions, but just to ask his buyer the right questions. Steve wants his buyer to come up with the solution. And, Steve wants his buyer to have clarity on that solution. Steve wants his buyer to own the solution, because, when that happens the buyer doesn’t say no to his own ideas! Doesn’t offer to leave the buyer to take up the conversation with a competitor…especially having done all the hard work. Why Does Steve Refuse to Catch Sales Rejection? That’s the killer question in this. Why does Steve not fold at the first no? Especially when so many other sales people just accept sales rejection as part of the job? Steve never progresses poor quality sales prospects through his sales pipeline…he cuts then loose when he realises either the prospect is not a fit for his solution or the solution is not a fit for his prospect buyer. What this means is, that by the time the buyer is ready to be closed, Steve knows its a great fit. Steve knows there is huge value for the buyer and that the buyer knows this. Which means it’s not about shoe horning a solution in. Instead it’s simply working out the the final details based on a foundation of great advice, trust and education. Steve doesn’t carry low level prospects with a vague interest in buying with a low value payback on his solutions. He leaves those to the other competitors in his field. Sales rejection, and the potential to be subjected to sales rejection starts at the very beginning of the sales qualification process. That’s why he has the best sales conversion rate. 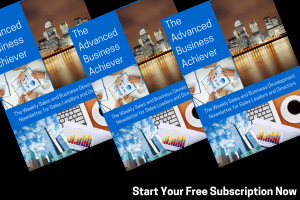 The highest average sales order value, the biggest lifetime order value. It’s the reason why Steve smashes his cross sell lead generation target and why CSI score is the highest in the team. Sales rejection need not be a sales killer but leaving handling sales objections to the end of the sales process definitely increases the chances of experiencing the symptoms which could so easily be avoided. This entry was posted in Blog, Sales Funnel Creation, Sales Performance Management, Sales Pipeline Management, Sales Training, Selling and tagged B2B Sales Training Courses, Handling Price Objection, Handling Sales Rejection, Objection Handling, Sales Audit, Sales Objection Handling, Sales Process Audit, Sales Rejection. Bookmark the permalink.